Call Us Now at 815-577-7500. Free Consultations. Cycling in the Chicago area gives one cause to feel both free and vulnerable. On the one hand, outdoor exercise provides a sense of well-being and allows for enjoyment of breathtaking sights of area life. On the other, the frenetic whir of traffic and daily life presents a sense of ever-present danger. A safety helmet is an unquestionable must-have item for cyclists of all ages and skill levels, but it can only protect the head and brain, leaving other areas exposed. 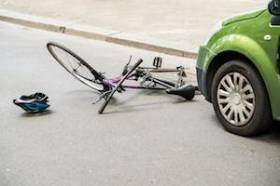 When a bike accident occurs, whether with another cyclist or a motor vehicle, the injuries suffered can be severe. The trauma suffered in a bicycle collision can result in substantial medical bills, as well as adverse effects on work responsibilities, educational pursuits, domestic life, and the ability to enjoy recreation and exercise. Fortunately, Illinois state law allows for personal injury victims to recover monetary damages for the harms inflicted by a negligent individual, business, or institution. 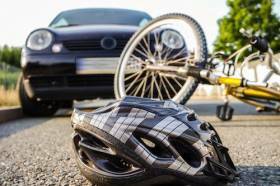 Bicyclists can be severely injured after being hit by a car or truck, even if proper safety measures are being followed. In the wake of an accident, the worst thing a cyclist can do is to shrug off any aches or pains and avoid seeking medical care. Common bicycle accident injuries include: broken limbs, brain injuries, nerve damage, and dental and jaw injuries. These can be extremely painful, they can take months or years to heal, and they can be expensive to treat. A law that recently went into effect provides that motor vehicles and bicycles are to receive the same rights on the road in right-of-way situations. The law went into effect on January 1, 2017. This is an important change that is meant to enhance the protections given to bicycles and may be helpful is bike accident lawsuits brought by cyclists. The law is named after an Illinois resident, Dennis E. Jurs, who died in a bicycle-motor vehicle accident in 2015. The driver of the vehicle was issued a traffic citation for his failure to yield to the right-of-way to the cyclist. How Can I Pursue Compensation for Injuries to Children? The Danger of Train Accidents in the U.S.
How Can I Receive Compensation for My Loved One’s Wrongful Death? We offer free consultations and extended hours by appointment including evenings and weekends. If you are unable to travel to us, we will come to you. NOTE: Fields with a * indicate a required field. From our office in Plainfield Illinois we serve clients in Will County, DuPage County, Kendall County, Kane County, Joliet, Naperville, Romeoville, Bolingbrook, Aurora, Lemont, Crest Hill, Shorewood, Lockport, Woodridge, Wheaton, Oswego, Homer Glen, Lisle and surrounding communities.